LAST YEAR: 9-7 record, early and late-season slides knocked team out of playoff contention and cost coach Jim Caldwell job. QB Matthew Stafford led pass-dependent offense with 1,000-yard WRs Marvin Jones and Golden Tate. CB Darius Slay emerged as one of league’s best in coverage. ALLEN PARK — Matthew Stafford has a lot of numbers on his side, supporting the case the Detroit Lions drafted the right guy No. 1 overall in 2009 and were wise to give him a $135 million, five-year extension last summer. The strong-armed quarterback has completed 62 percent of his passes over his career for nearly 35,000 yards with 216 touchdowns. After injuries stunted the start of his career, he has started every game for seven straight seasons. But he hasn’t been able to change Detroit’s number of postseason victories since the franchise won the 1957 NFL title. Stafford has helped the Lions reach the playoffs three times, losing a wild-card game each time to leave them stuck on one postseason victory in six-plus decades. He knows that fact as well as anyone in the Motor City and yet he insisted that doesn’t get him down. 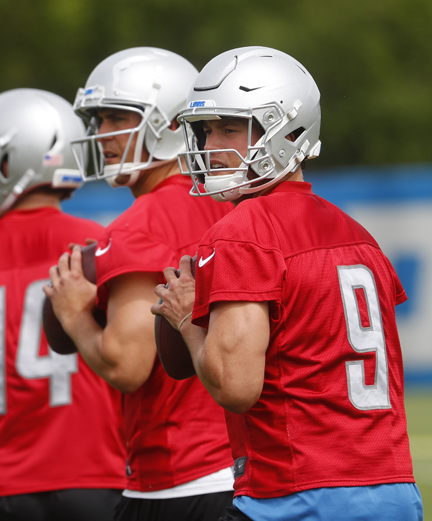 Stafford was beginning his 10th training camp this morning, aiming to help Detroit avoid having just another mediocre season in Matt Patricia’s debut as an NFL head coach. The Lions won nine games each of the previous two years and coach Jim Caldwell lost his job after the team didn’t return to the playoffs last season. Stafford seems set up for success on offense, working with a familiar offensive coordinator, Jim Bob Cooter, and throwing to returning veteran receivers Golden Tate and Marvin Jones. More importantly, the team has invested in improving the running game through free agency and the draft by bolstering the offensive line and backfield. The Lions have been among the NFL’s worst rushing teams in recent years, helping allow opponents to sack Stafford an average of 43 times over the past four seasons. Despite the slew of sacks and even more hits, some leading to injuries, Stafford has been able to stay on the field. “When I came into this league, I was 21 years old and I felt pretty good most days,” Stafford said. “I’m 30 now. I don’t feel bad, but it’s different. A little bit of a new normal. Stafford could potentially be entering the prime of his career. “Quarterbacks in this league really develop pretty well at this sort of age range,” Cooter said. “He’s getting better at different things. Every year we have different sort of points of emphasis. It could be throwing a certain pass, it could be pocket movement or it could be something with his feet. Stafford has become savvy with the media over the years, answering questions while avoid controversy. He doesn’t make bold predictions and rarely goes out on a limb on any topic. The husband and father of two young girls seems to strike a life-work balance, but his competitive streak can be heard at times when he hears doubters. NOTES: The Lions signed DT Ricky Jean Francois and LB Darnell Sankey. They released LB Al-Rasheed Benton and OL Beau Nunn. … Detroit put LB Devon Kennard and DE Cornelius Washington on active-non football injury list.